It’s time to stand up for African elephants again. And now lions, too. We can’t allow elephants to become an artifact of the past. 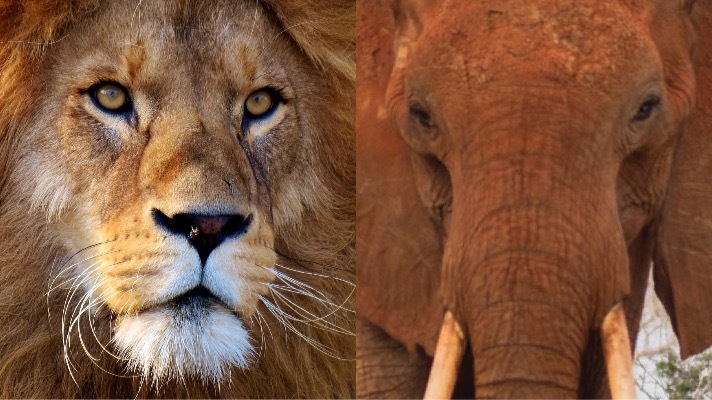 Stand up for elephants, lions and other wildlife today. 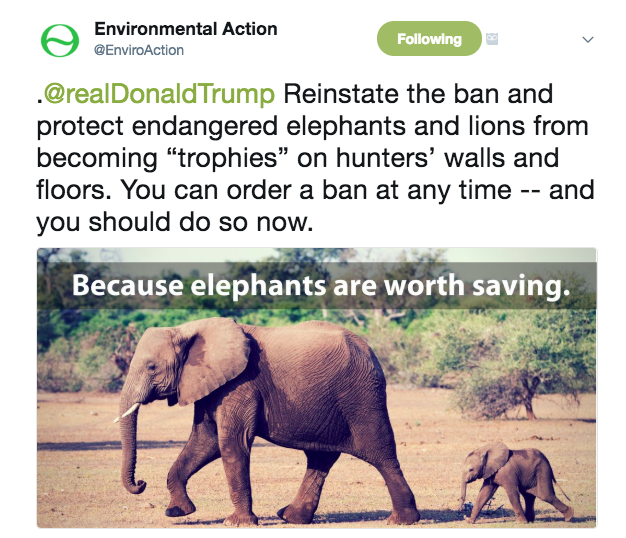 Ask President Trump to follow through on his plan to ban bringing African elephant tusks and lion hides into our country on Twitter or Facebook. Last fall, the U.S. Fish and Wildlife Service (FWS) announced it would allow big game hunters to bring African elephant “trophies” into the U.S. under certain circumstances. We couldn’t have made the case any better than the President. But it seems the FWS didn’t get the message. This is unacceptable. With just 415,000 African elephants left in the world, now more than ever, we need to stand up for these vulnerable creatures and other wildlife. Fortunately, this doesn’t need to be a done deal. President Trump can order a ban at any time, just as President Obama did. And, on this issue, President Trump has shown that he’s sensitive to public opinion. Please send him your opinion today on Twitter or Facebook, and ask him to ban hunters from putting their so-called “trophies” on their walls and floors. Tell Pres. 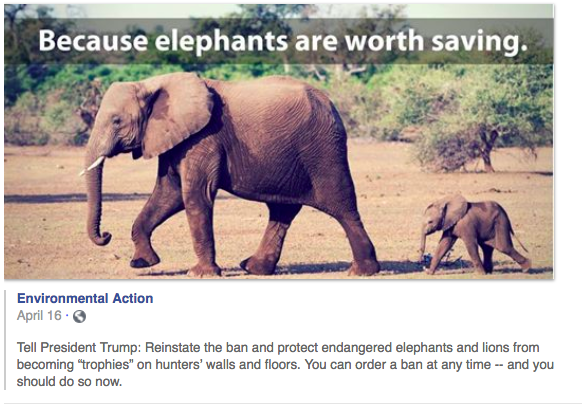 Trump: Save elephants, lions and other at-risk wild creatures. 1. Michael Biesecker, “Trump Wildlife Protection Board Defends Trophy Hunting,” AP News, March 16, 2018. 2. Rachel Nuwer, “U.S. Lifts Ban on Some Elephant and Lion Trophies”, The New York Times, March 7, 2018.